Review: Film fans of my generation tend to gripe about the lack of quality genre fare these days. Where’s the heir to ‘Star Wars’? Can’t somebody make a film as innocent and tearjerking as ‘E.T.’? Whatever happened to weird and wild fantasy films such as ‘Legend’, ‘Conan the Barbarian’, ‘The Neverending Story’, and the ‘The Princess Bride’? Why did they stop making good movies? The answer to all these questions, of course, is that my generation is blinded by nostalgia and cannot see the fantastic stuff that’s right in front of them. For the most part, if a movie comes close to the pure fun quotient of ’80s classics, it ends up oddly ignored, or worse, needlessly criticized. For example, J.J. Abrams’ ‘Super 8’, the heir apparent to ‘E.T.’, nailed the tone so precisely that it was largely rejected by geekdom as a suspicious attempt to cash-in on nostalgia. It’s happening again with Pixar veteran Andrew Stanton‘s first live action film, ‘John Carter’, which successfully adapts Edgar Rice Burroughs‘ novel ‘A Princess of Mars‘ into a film as gleefully exciting as the original ‘Star Wars’. And so, ironically, the generation weaned on Lucas’ fantasy films refuses to embrace the very thing they want. If Stanton made a major mistake in adapting ‘John Carter’, it’s in assuming that people actually buy into this stuff anymore. Not that you can blame him. One would think today’s audiences, who complain endlessly on the internet about Michael Bay and Stephen Sommers movies, would eat up a genuine film adventure if they had the chance. Of course, today’s audiences have shown their true feelings by rewarding the likes of ‘Transformers’ with billion dollars grosses, so it should come as no surprise to Stanton if ‘John Carter’ fails to make bank. Which isn’t to say that today’s audiences can’t reward a great movie when it arrives. Nolan’s ‘The Dark Knight’ and ‘Inception’ deserve all the attention they get. So does the ‘Harry Potter’ franchise. But note that even ‘Harry Potter’, which got its start overflowing with childlike wonder, became steadily darker and grittier — and so the box office grosses got higher. Cynicism, violence, tragedy, and brooding seem to resonate with audiences far more than ever. Critics often highlight the ’70s as the most “adult” cinematic decade, but I’d argue that the 2000s threaten its crown, since even the family fare, Pixar aside, tended to reward cynicism over wonder. You couldn’t have a ‘Close Encounters of the Third Kind‘ in the ’10s. People wouldn’t understand it. Wonder, therefore, is the crucial ingredient of all those beloved childhood classics. Stanton and company get it. They infused ‘John Carter’ with it, creating a vigorous, heedless, and beautiful film. It’s not always pure cinema, but then again neither was ‘Star Wars’, which is something people tend to forget. For my money, ‘John Carter’ has more wide-eyed wonder in a single scene than James Cameron’s derivative ‘Avatar’ had in its entirety. Consider the hero’s arrival on Mars, or, as the inhabitants call it, Barsoom. As he tries to walk, he accidentally catapults into the air repeatedly, comically landing in the dust over and over, until he realizes that he can jump hundreds of feet with a single step. In the course of two minutes, we’ve gone from shock, to frustration, to comedy, to revelation and wonder. In short, in but two minutes, we’re caught up in true adventure. This is what we’ve been missing — a flexible tone, rooted in character, exercised to exhilarate the audience. This continues through the entire film. Sonically, the film has a very strong backbone, courtesy of Academy Award winning composer Michael Giacchino — who really is the new John Williams. The main theme conjures up ‘Indiana Jones’ and ‘Lawrence of Arabia’, meshing perfectly with Edgar Rice Burroughs’ pulp universe. In my view, a film composer’s responsibility is to richly evoke every unique character and scene, tying the emotional core to the viewer. Of course, this assumes that there’s an emotional core to tie, but Stanton doesn’t let Giacchino down. Since its tone and its overall execution are spot-on, one would think people would respond as strongly as they once did to this kind of thing, but nay! Audiences are suspicious of it. ‘John Carter’ has far fewer script issues than the ‘Star Wars’ prequels and ‘Avatar’, but people readily bought into those films, only to trash them later. Truly worthy blockbusters are rare. More often than not, great films are ignored, only finding audiences long after the fact. Here’s a movie with a brisk, familiar narrative, elevated by strong characters, inventive action, stunning visuals and a stirring score. You know, like ‘Star Wars’. 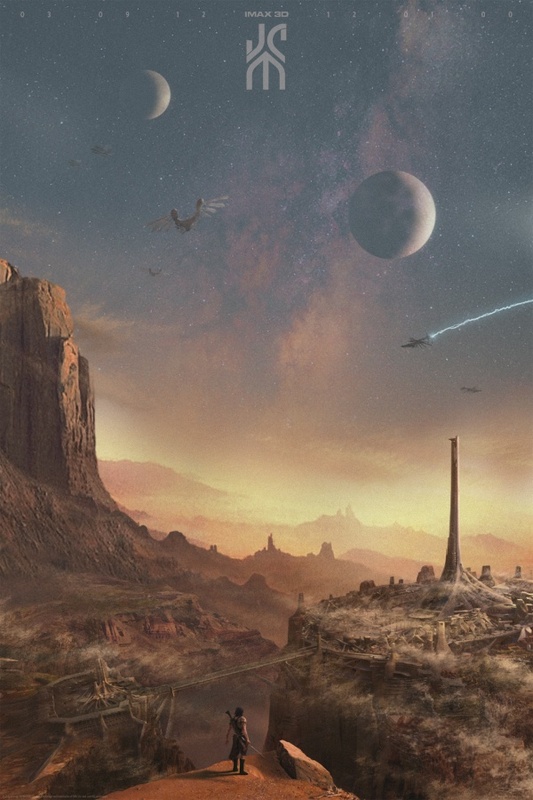 Yet ‘John Carter’ is poised to land soft in the U.S. box office. We don’t know what the hell we want. There’s still hope that ‘John Carter’ will hit the world box office hard, but regardless of how it does in theaters, I believe what we’re looking at here is a cult classic. Considering how many fantastic films have taken ten years or more to get the recognition they deserve — Keaton’s ‘The General’, Carpenter’s ‘The Thing’, Fincher’s ‘Fight Club’, to name a few — this bodes well for ‘John Carter’. If you truly love the movies, if you thirst for adventure, then this wonderful film is for you. Don’t let the magic of cinema go unrewarded. See it now. Review: Politics is warfare without bullets. All war is really about who we identify with, and why, and to what extent we will defend our collective identity and all that it means to us. It’s been said that the first casualty of war is innocence (or truth), and by extension, we understand the true casualty is the human soul. 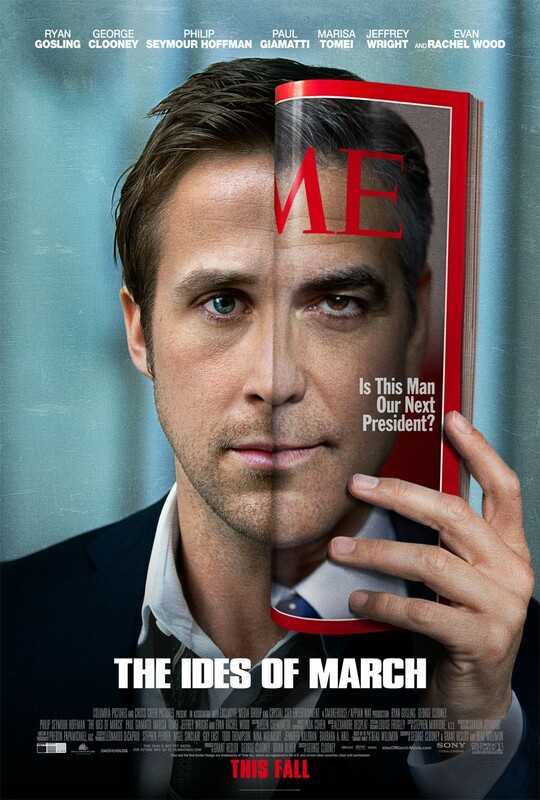 George Clooney’s 2011 film ‘The Ides of March’, adapted from the play ‘Farragut North’ by Beau Willimon, is about that terrible moment of spiritual violence as it occurs in two men: Junior campaign manager Stephen Meyers (Ryan Gosling) and Governor Mike Morris (George Clooney). They are mirror images of each other; idealistic, brilliant, driven, and undercut by their own pride and lust. In the film’s opening scene, Meyers walks on stage and gives a speech which is effectively an oath of religious loyalty to the United States Constitution. It turns out he’s simply reading Morris’ lines, doing a sound check on a darkened stage, but we don’t doubt for a minute that he believes it as strongly as Morris. Stephen Meyers is the ultimate political enthusiast; he ties the very fate of his soul to that of his candidate, and views himself as an extension of the candidate’s identity, as if Meyers was a fragment of Morris that converses with him from outside Morris’ conscious mind. In war, soldiers wear a uniform to subsume them into the group, and in politics, the fighters wear their candidate, whether in campaign paraphernalia or ideology, and the effect of both strategies is to make the individual’s fate concurrent with the whole. When the political bond between candidate and supporter is strong enough, all it takes is a single, critical mistake to reverberate through the entire campaign and force the parts of the whole to face each other as individuals. The first sign of trouble appears when Meyers accepts a meeting with a rival campaign manager (Paul Giamatti,) who offers him a job, and the crucial tip that both campaigns are gunning for the same supporter. Meyers refuses the job offer, but his rival insists that Morris is like any other politician; prone to corruption and bound to fall. Because Meyers does not alert his own boss (Philip Seymour Hoffman) to the illicit meeting and its details, he becomes the target of a savvy reporter (Marisa Tomei) and begins to keep secrets, justifying them by his crucial role in Morris’ campaign. He begins an affair with a beautiful intern (Evan Rachel Wood,) only to discover that Morris has been with her as well, and has impregnated her. With his own corruption weighing on his soul, and his candidate’s idealistic façade exposed, Meyers chooses a dark path to save the campaign. The scene in which Meyers make his decision is well-executed on every front. He sits in his car in the dark under pounding rain, voice mails echoing in his head like accusing spirits, while Gosling plays Meyers as utterly overwhelmed, his tears lost in the reflection of raindrops on his face. Not only is Clooney’s direction solid, but his portrayal of Morris is subtle and believable. Like Meyers, Morris is on the defensive, and even before corruption infects the campaign the two men are subtly at odds, vying for control over the message. Clooney plays Morris as a man who has lied to himself to protect his ideals because he believes that the message is more important than his conscience. To Morris and Meyers, the war trumps the solider; a little bloodshed is necessary to win the fight, and what does it matter if it’s their own persons that are destroyed in the process? When the two men finally face each other, instead of letting the campaign go to save themselves, they agree, in effect, to destroy each other’s souls. Considering how profundity bleeds from the film’s subtext, I have to admit I find it more than a little odd that critical reaction wasn’t more favorable. This is a great thriller, one fashioned in the mold of ’70s political films like ‘All the President’s Men’, with a kind of cynical clarity of vision. Its most direct homage to the era is its darkly ambiguous ending, which may be the reason some critics find the film underwhelming. The film doesn’t tie up everything in a neat little bow, instead cutting to black right before a climatic decision is made, and in doing so Clooney denies us the most obvious form of catharsis. Instead, we must provide our own, dwelling on the film’s powerful themes until we realize the film isn’t about Stephen Meyers, but what it means to live in a society where political responsibility rests on our shoulders. The film ends with Gosling’s character breaking the fourth wall, looking us in the eye, in effect asking us, “What decision would you make?” In the campaign for the heart, you decide who wins. Review: Steven Spielberg is best when he mixes the fun and the profound effortlessly. His most classic works take the popcorn themes of B-movies and blend them with a depth and wonder typical of only the A-list elite. By doing so he has made classic after classic: ‘Jaws’, ‘Close Encounters of Third Kind’, ‘Raiders of the Lost Ark‘, ‘E.T.’, and ‘Jurassic Park’ among them. This is also why ‘Jurassic Park’s ill-executed sequel, ‘The Lost World‘, fails. There’s plenty of B-movie, but no sense of weight and drama. It’s a piece of eye candy that turns out bittersweet. The problems become clear right from the beginning of the film. Only two of the main characters from the original return in the sequel, neither of them are Sam Neil or Laura Dern, who were the leads. Instead, Jeff Goldblum, who plays the sarcastic mathematician Ian Malcolm, is left to carry the film, while Richard Attenborough is resigned to an almost cameo status as the billionaire who funded the project to genetically clone dinosaurs, appearing only at the beginning and the end. A good rule of thumb for Jeff Goldblum’s acting is that it is best relegated to supporting roles. With the exception of 1986’s ‘The Fly’, his style of dry and ironic humor fails to win him much sympathy from the audience. He seems out-of-place in this movie. He isn’t helped by the rest of the cast either, all of whom are either underwritten or completely stereotypical and uninteresting. The film’s plot centers around Site B, another island that happens to have dinosaurs on it (for reasons too lengthy to delve into, this island’s existence contradicts half a dozen plot points from the original Jurassic Park) and the “evil corporation” trying to capture these creatures to bring them home to the mainland. Ian Malcolm leads a team trying to stop them, though it is never really justified why he, a mathematician who knows next to nothing about dinosaurs, is qualified to do this. The entire plot is very forced and superficial. 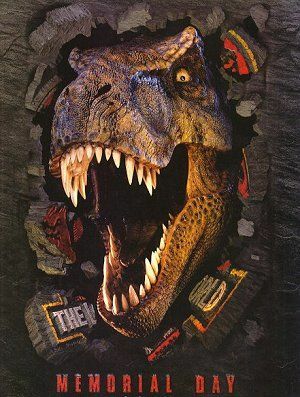 It ignores much of the established story from the original just to show off the film’s computer generated dinosaurs. Yes, these creatures are well designed and a marvel of special effects, but the rest of the film feels so dreary and shallow by comparison. The all-important depth and wonder isn’t present here in the least. There is no strong theme running through this film, no moral lesson about the dangers of science (something the original film at least touched on before showing off its creatures) or mankind’s arrogance. Characters don’t seem bedazzled in the least that they are looking at creatures not seen on the planet in eons. And if they aren’t impressed, why should the audience be? In short, this is just monster movie and nothing else; a B-movie that is watched once and quickly forgotten. This is the failure of ‘The Lost World’, a fact made worse by the otherwise outstanding resume of Steven Spielberg. The man clearly understands how to make good films out of traditionally corny subject matter, so why he failed here is something of a mystery. It is possible that he simply wanted to make a movie that was fun; not wanting to go anywhere serious with it. For Spielberg, though, if his goal is to make good movies, then he’s better off-putting real weight into the story and leaving the true B-movies to the likes of Roger Corman and Michael Bay. In short, not even dinosaurs can save this poorly casted, thinly plotted ship from sinking. Spielberg could’ve made something brilliant, insightful and jaw dropping. Instead, he made ‘The Lost World’.